Jolly Fish Press, 9781631631061, 448pp. It's summer in Emmett's Bluff, and the ice is spreading. Six months after confronting an enemy from the future, Malcolm and Valentine Gilbert have returned to their normal teenage lives. Or, they've tried to. During the battle to save their town, a mysterious force awoke inside the twins. Time calls to them, and it's growing too strong to be ignored. When warriors from a mysterious ancient kingdom appear, they bring warnings of an unstoppable foe--one whose control of the ice is powered by Time itself. 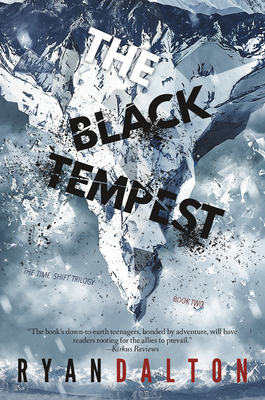 But ice is far more than the Black Tempest's signature. As the twins uncover the truth behind it, they realize their town is only the beginning. If the Black Tempest is not stopped here, his corruption will threaten the very course of history. As cold advances and doom draws near, the twins' only hope lies in learning to wield Time itself, and in trusting their strange new friends--even if those friends have secrets of their own. Ryan Dalton is a freelance writer and a writer for the board game Exile Sun. He is the author of The Year of Lightning. He lives in Phoenix, Arizona.